Every year, the city of Blackpool comes to life. 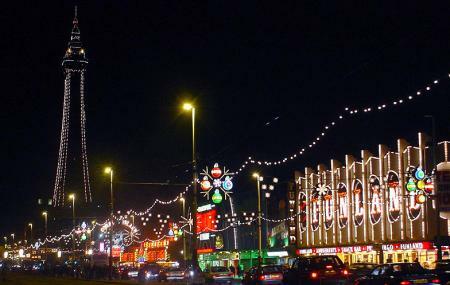 For 66 a days a year every autumn, the city is home to the now famous Blackpool Illuminations, a unique festival of lights. Dubbed the greatest free light show on earth, this unbelievable spectacle is a massive installation stretching across the Blackpool Promenade, and features tons of different illuminations that will keep you stunned all night long. The Blackpool Illuminations have been held since 1879, and is held every year, typically from August to November. 2013 was the first year that the festival was held for 73 days instead of 66, and it seems like the trend will continue over the years to come. There are a lot of incredible tributes to modern day cultural icons, such as the Doctor Who illuminations, created as a homage to the hit English TV show. Another great annual installation is that of the Illuminated Trams, which run the length of the promenade during the festival. 2014 promises some new installations like Alice’s Garden, drawing on Lewis Carroll’s timeless classic Alice in Wonderland for inspiration, and the Mat Hatter’s Tea Party in particular. Also coming up in the 2014 edition is the Dynamo, a new exhibit near the south pier with ever changing spinning colours in a whirlwind of light. If you happen to be in Blackpool during the Blackpool Illuminations, get into a cab, hop onto a train or just take a walk down the Promenade to witness this fantastic show. This is one sight that has to be seen to be believed. Switched on every evening for 66 days every year. In 2014, the Blackpool Illuminations are being held from 29 August - 9 November. Make it a point to go before sunset so you can witness the entire installation being illuminated, a breath-taking sight in its own right. The Blackpool Illuminations also host various musical events and other entertainment shows. Check the website to stay updated on the same. Buses No: 1, 12, 14, 16, 61 travel to the Promenade, the location of the Blackpool Illuminations. How popular is Blackpool Illuminations? People normally club together The Blackpool Tower Dungeon and Ripley's Believe It Or Not while planning their visit to Blackpool Illuminations. Great night out. Many clubs. Friendly atmosphere. Generally locals are really friendly. Lots to do. Would visit again. Went to Blackpool over the bank holiday with the family, you either love it or hate it. We love it for a day out but don't go very often. We went on the pir just past the tower which feels like going back in time, far better than the hustle and bustle of the other piers. Had a good walk on the front and enjoyed fish and chips before coming home. Always nice to come and see the illuminations usually go mid week when it is much quieter and then still park up and walk as its just nicer to be able to stop at your leisure and enjoy it. Nothing quite matches the majestic beauty of Blackpool illuminations. Sure, nowadays you can get a flight to Rome and see the Sistene Chapel for less than a train ticket to Blackpool. But the extra money is definitely worth getting to see some poorly strung lights, hanging next to a rusty tower whilst drunken been parties pass you by singing about knobs.